The Ralph Lauren Polo fragrance is 30 years old this year, so don’t complain about how popular it was in your high school years or we’ll all start calculating your age. Polo Modern Reserve, a new, ‘updated’ edition of the 1978 Polo fragrance, was created to: 1) celebrate Polo’s birthday (it is an accomplishment to make it to age 30 in the crazy, fickle world of perfume) and 2) appeal to original Polo wearers’ male offspring — men between the ages of 25-30. Polo is still one of the top 15 men’s fragrances in the U.S.* so WHY imply it’s “dated” and for ‘old’ guys? Polo contains artemisia, basil, bergamot, chamomile, cumin, juniper berry, geranium, carnation, jasmine, ‘pine needle,’ rose, thyme, tobacco, amber, cedar, leather, musk, moss, patchouli and frankincense. That list of WHAM! BAM! POW! ingredients does not read (or smell) “old” to me; Polo is vibrant and interesting and blows most mainstream, and niche, male fragrances out of the eau (de Toilette). Polo Modern Reserve takes Polo’s formula, erases the tingly, bursting-with-life green notes, replaces chamomile with cardamom, tobacco with vetiver-leather, juniper berries with pimento berries, and frankincense with myrrh incense. (Other listed notes for Polo Modern Reserve are basil, liquid jasmine, humidor wood, patchouli and ‘sueded’ leather.) Like Polo, Polo Modern Reserve was developed by perfumer Carlos Benaïm. Judging from Polo Modern Reserve, Ralph Lauren believes the Sons of Polo are more subdued than their fathers. Polo Modern Reserve has a quiet opening, a mix of bergamot with a hint of flower (the liquid jasmine?) One does smell some “reserved” cardamom too. As Polo Modern Reserve races through its development I detect seconds of pimento, and a few minutes of myrrh and leather/suede-vetiver. Polo has been “lobotomized” to create Polo Modern Reserve and Polo Modern Reserve presents a blurred, chalky ghost of its ancestor. Give me “Old” Polo any day of the week and keep the ludicrous comments about the ‘aging effects’ of tobacco and chamomile notes in perfumes to yourselves! As Polo Modern Reserve enters its final stage of development, it strongly resembles Polo: I smell soft woods, patchouli and sweet musk; The End is the best part of Polo Modern Reserve. Leslie Marino, general manager of L’Oréal Designer Fragrance Division, said Polo Modern Reserve is “…a little stronger and more masculine” and uses “purer raw materials” than Polo. On me, Polo Modern Reserve is no stronger than Polo and since the pricing is identical for both fragrances, I doubt the raw materials are any purer (Polo Modern Reserve may have fewer ingredients than Polo). Overall, Polo Modern Reserve is a bland fragrance and to sell it for $200 in a deluxe edition is like putting a mule in a horse’s harness; the deluxe packaging should be for Polo — the birthday boy. 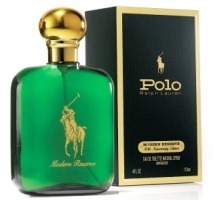 Polo Modern Reserve Eau de Toilette is available in two sizes: 120 ml. for $62.50 and a $200 limited edition 240 ml Eau de Toilette in a numbered leather box with 24-karat-gold details on the box and bottle. It can be found at major department stores. * Women's Wear Daily, 10-10-08. Kevin: I am old enough that Polo was popular in high school (I owned a bottle), along with Drakkar Noir, but I am NOT old enough to have a 25-year-old son!!!! (well, maybe technically…) You may do the math IF you like. I will want to put spritzes of the original and this newbie on each arm next time I'm in a department store, for nostalgia's sake. However, there's probably no way I could ever wear Polo again without risking bad memories of feathered hair (or having hair), pastel-colored Polo shirts (though they've made a comeback), and teenage angst (which has been replaced with angst of a different kind). Are you telling me the SMALLEST size is 120ml? Joe: I'm guessing 41…that would put you at 16 when siring your 25-yr-old son. HA! Yes, the smallest bottle is 120ml…so the pricing is very inexpensive isn't it? You're close enough for it to be scary, but you know, I'll NEVER tell…. That doesn't even sound very modern!!! chamomile, juniper berry, pine needle, birch, leather, musk, moss, and myrrh. Or maybe they should replace chamomile with iris. idk, maybe they should just replace the entire thing with Zagorsk. yes!! Zagorsk should be the modernized Polo. krokodilgena: Zagorsk IS good and your list of notes for the revamped Polo is nice…too bad they didn't consult you! I've only tried Polo once and I remember it being *heavy*. If I had a boyfriend and I was to force a fragrance on him, it would probably be Dior Homme, Fahrenheit or one from the CdG incense series. But not Bvlgari Black because that's what I'll be wearing. Axe really needs to start consulting me. I've always loved how the original smells on others, but have never owned a bottle. I've had Blue and Double Black through out the years. Have a great turkey day Kev! You too C…and give the boys a LOT of turkey! Polo was for the preppy guys and Drakkar Noir was for the disco guys. I guess you can pretty much tell how old I am from that–though this was in college, not high school. I do fondly remember a Billy who wore Polo. . .
OK before anyones starts calculating, I am 43! GOD, it's back!!! hopefully, the price tag and the changes in formula will make it bearable…. at least it's not Azzaro!!! platinum15: HA! You've just dismissed/dissed three ICONS of male fragrance all in a couple of sentences. Azzaro/Dakkar Noir don't thrill me…Polo I like (thankfully, it was never a “hit” in my school). You know, LucaTania seem to love Drakkar and Azzaro Homme. I've never smelt Azzaro but I've been wanting to — I never see it in my local dept stores (just the ubiquitous Chrome). Joe: it lives on in discount heaven…rarely do I see it in a store. When people wore jeans, I wore tweed pants, when they wore football jersey, I wore shirt and tie, when they wore Polo/Dakkar/Azzaro, I wore Antaeus, Trussardi Uomo, and Jacomo by Jacomo (which to me is a distant cousin of Polo…). Dune for men and Gendarme are nice scents. Very understated. 120 ml is a lot of juice. I love Polo, worn sparingly, it's quite nice. You know man, the real deal is what all the ladies love on Manny. But for those, ahem, special occasions, Manny goes back to the Drakkar Noir. Nostalgia is a lady killer, man. that is what it is all about. I was once a mainstream fragrance rep and then i was lucky enough to work for L'artisan for 2 years. They are true to what they say. great product and knowledge comes from this company. If i could i would have them make me a custom fragrance. krokodilgena, I have a boyfriend who has learned to “appreciate the world of fragrances” because of me:)) He is forced by my to wear Dior Homme, otherwise I'll be taking over the bottle. He loves Fahrenheit, he always have, even before we met. He also fell in love with CdG Incense Series because of me! He took over my bottles of CdG incense series!!! He told me that I have enough perfume bottles, and enough cool niche stuff. He told me that Incense is his own little niche world, and that he will let me smell them “sometimes!”! I just got a bottle of this fragrance, and its dissapointing.